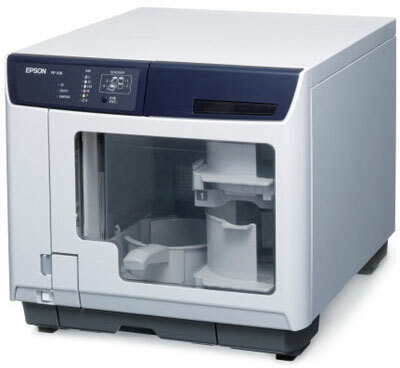 The Epson Discproducer 100 Disc Publisher is the fast, easy and economical way to get your disc publishing jobs done. It has all the features you need to print and burn up to 100 customized CDs or DVDs at a time. From its vibrant six-color inkjet printing and precision AcuGrip robotic arm to its easy-to-use software and unmatched reliability, with the Discproducer 100 Disc Publisher you'll get the high quality results you're looking for every time. Autoprinter (PP-100AP). Disc printing only, 100 disc capacity, prints 95 disc/hr, 6-color inkjet printer, USB interface. Includes: Total Disc Maker, Total Disc Monitor, Total Disc Setup Software, ink, AC cable, & manual. Standard 100 Disc Publisher (PP-100). 100 disc capacity, publishes 30 CDs/hr or 15 DVDs/hr, 6-color inkjet printer, USB interface. Includes: Total Disc Maker, Total Disc Monitor & Total Disc Setup Software. Network Security Disc Publisher (PP-100N Security). Access Control Modes, 100 disc capacity, publishes 30 CDs/hr or 15 DVDs/hr, 6-color inkjet printer, USB + Ethernet interface. Includes: Total Disc Maker, Total Disc Monitor, Total Disc Setup Software & Total Disc Net Administrator. Network Disc Publisher (PP-100N). 100 disc capacity, publishes 30 CDs/hr or 15 DVDs/hr, 6-color inkjet printer, USB + Ethernet interface. Includes: Total Disc Maker, Total Disc Monitor & Total Disc Setup Software.